Sunday is My Day of Rest?? My days are so busy that it seems like if I don't get everything done on a Sunday, then the list of Must-Do's gets carried over to the next week. So, when I should be thinking Christian thoughts and relaxing, I find myself pulling the oven out and washing underneath, planting the garden, checking my son's head for lice, cleaning toilets, mending, washing floors, filling out forms, and baking granola for the coming week. Did I mention laundry? It never ends. But I am working really hard on a number of textile pieces to get to the framer. I am joining the Back Lane Artist Co-operative http://www.facebook.com/pages/The-Back-Lane-Gallery-Killarney-Artist-collective/183402851690156 in Killarney. Deborah O'Keefe is the woman who had the inspiration to get it started back in November and she is doing well, recession be damned! She paints herself and she has a number of artists and craftspeople under her roof, including Bluebell Eco Candles and painter Tina Reed. Take a look at her blog at http://thebacklanegallery.blogspot.com/. So, I need to step up my game to present some quality pieces. I had stacks of dyed and stitched pieces, it was just a matter of deciding what to do with them. I finished stitching three pieces yesterday and it's a matter of deciding if they need more embellishment. One needs a few seed beads and another one I am going to play with text and stitch some paper onto it and see how it looks. Plenty to do! Tomorrow is the meeting at Kerry County Council Offices in Tralee with Fruition, the new Craft Coordinator for the Year of Craft. It runs 10-1130am and will hopefully generate some great new ideas on how to boost Kerry artisans into the national forefront, or at least give a strong profile for all those people in Kerry who want to buy locally. Gearóid O Duinnin's stunning abstract, "Horsie." Is the fog literal or metaphorical? In this case, both, I think. The day is dull and white, with a steady drizzle. It makes it hard to get up and going and after three cups of coffee, I know it just isn't going to be a productive day. Last night we had our Craft in Kerry meeting and we are progressing along nicely. It's a lovely group of people to be working with, happily everyone seems concerned with the group and not individual needs/wants. There's a lot of start up work to get underway and really things should settle down a bit once we have our first event under our belt. The great news is that the craft fair is going great and we have a photo in the Kerry's Eye coming up this week. An interview with Weeshie Fogarty should really get the word out in Kerry. The next meeting is on March 27th in Castlemaine. 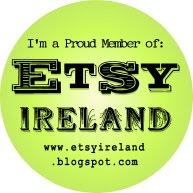 Keep an eye on the Craft in Kerry page on Facebook http://www.facebook.com/pages/Craft-in-Kerry/172314459478834 for up-to-date information. I really dislike Valentine's Day. I think I always have. Not because I don't have a boyfriend/husband, but because I don't believe in one day to tell people that you love them; you have to do it all year round. I used to have a roommate when I lived in Boston who taught English to male prison inmates. She was an attorney by trade and she told me once that inmates hate Valentine's Day and that they would do anything to avoid it, often getting put back in jail. She used to force them to write out letters to their wives/girlfriends/children to atone for bad behavior, but it got me thinking: how bad is a holiday if it forces men to commit crimes to avoid it??? No patience for it really or the artificial, saccharine sweetness of it. Why does an expensive gift or an engagement ring prove they love you, when surely the handmade card or dinner shows more thoughtfulness? So, on that note, I thought I would PRETEND it wasn't nearly Valentine's Day and felt my way through it. Since I have books on the brain, I decided to make a cover for my really horrible looking diary that I bought to organize myself. I like to write in books and I like to read books, so don't try and convert me into using a Blackberry or a Kindle; won't work. Kindles don't smell like aged paper and there is no pleasure in eagerly turning it's pages. I imagine it also doesn't relax you as much looking at a screen as reading a proper book would. I know it's probably convenient to put 40 books into one Kindle, but I am really not a convenient person. I measured my diary and cut out a piece of foam underlay to suit and went gathering my fibres. Since I would be using the cover for the year, I wanted something nice and girly and fun. Purple! Found some nice dyed silk pieces from last September and flipped some on there, as well. Felted in the usual way and I ended up with the above photo. I then machine stitched a quick design and sewed a few beads in the centre for a flower design. One thing that you can say about Irish weather: it is really conducive to staying in and crafting! It's Day Three of the rain and wind, although the wind is a bit calmer this morning, and I felted a book cover for my new diary and I will be stitching that. I have a patchwork project to finish. I don't know if any of you have a clean dinner table, but mine is always half-covered with projects waiting for time and supplies. I am determined to have it clear by tomorrow night to start the week off right! ﻿ I got one of my UFOs finished this week: a piece that I had felted and resist-dyed with soy wax earlier in the year. The soy wax was great, but it's supposed to wash out with simple soap and water and I had a little trouble getting it out. I went online and did a bit of research and lo and behold! if you read directions things DO come out better. Turns out the wax has to be pretty hot when applied (but not smoking, as there is a flash point) or else it doesn't saturate properly. I ended up using too much wax and so it was harder to get out. Learning curve! Essentially it's a batik process. I couldn't decide what to do with it and I just decided that I was being too precious about it and collaged some fabric onto it. It turned out great (I think!) and I am going to develop a line of fibre collages as the woolly hats and scarves will not sell well in July and August! I also stitched a paper and fabric piece that I am happy enough with, so more time for experimenting with that if the weather continues to be dire. I also started felting again after the right arm decided to get cranky and have tendinitis. Not sure what aggravated it. This is the answer the doctor gave me: "Yerra, it could be anything really." Very technical. So I had a highly unproductive January. I decided to start small and felt a cover for my diary as it is a really icky green and I couldn't be looking at it anymore. I love my purple, so I picked out a nice mix of merino and silks that I had dyed and felted it using foam underlay as a resist. Design came out well = the diary fit in it, and I want to stitch it a bit, so I will post again tomorrow with the results. I have ordered an instructional DVD from Interweave Press in the US and I am dying to receive it and the back issues of Cloth Paper Stitch that are on the way. I ordered it December 31st and it has not arrived yet. Needless to say, I will not be ordering anything from them again soon. I order hair conditioner and soap from a US website and it's at my door in 10 days in total and they don't charge me a fortune in shipping, either. Interweave has got to get their act together. Unfortunately, I love, Love, LOVE Cloth Paper Stitch, but I can get it from http://www.rainbowsilks.co.uk/ fairly quickly. I can't seem to get anyone in Ireland to stock the magazine and I NEED it :) Their mixed media stuff is always interesting and always makes my brain hum. I also have a copy of the book I have been coveting for some time on the way! I had been *hoping* that Santa might bring it to me, but I guess he had his hands full trying to sort out the Irish government. One of the many ways we are being made pay for their incompetence. Jane Dunnewold is supposed to be the surface design guru, so this book has me drooling. I hope this book lives up to it's reputation as there aren't many textile courses going in West Kerry at the moment, so it's all DIY for me! Now, must get off the computer and get some work done!